A few days ago, blog reader Tomás Peyré commented on the fact that the pause function has a memory leak on R2011b and R2012a, and advised using the Java Thread.sleep() function instead. This got me started on a comparison between these seemingly-equivalent functions. It turns out that the Java variant not only does not leak memory like its Matlab counterpart pause – the Java function is also much more accurate in its pause duration. 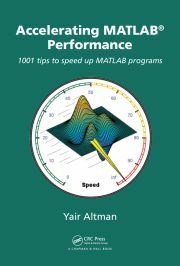 When the pause duration is further reduced, Matlab’s inaccuracies increase (120% at 0.01, 370% at 0.005) to a point where we cannot in practice rely on them. Apparently, Matlab’s pause function has an inherent inaccuracy of several mSecs that increases as the pause duration decreases. The effect of increasing absolute inaccuracy with decreasing total pause duration is catastrophic. On the other hand, Java’s inaccuracy remains stable at <1 mSec, making its relative inaccuracy degradation much more gradual and acceptable (8% at 0.01, 20% at 0.005). Matlab’s pause function has an important side-effect, that may partly explain the discrepancy: Whenever pause is called, the graphics event queue (EDT) is flushed, thereby updating all Matlab figure windows. In my tests above I did not have any open figures, otherwise I suspect the discrepancy would only have been larger. This side effect is actually quite important when integrating Java GUI components in Matlab figures. First, the results may be platform-dependent. Running R2012a on a Mac (OS X 10.6.8), I get more comparable inaccuracies for MATLAB and Java. Mean inaccuracy for MATLAB is about 0.38 msec, and Java is about 0.26 msec. Also, unlike your results, those inaccuracies are roughly constant when I reduce the input duration. Second, I notice that one does not need to take the absolute value as you did. The error is systematically positive. This is presumably because both MATLAB and Java choose to pause for at least the prescribed duration. @Tim – Thanks for your comments. Unfortunately, at least on Windows the error is sometimes negative, hence my use of abs(). I have noticed that there are issues with MATLAB hanging up when using inputdlg and other modal dialog boxes. These issues are solved by putting a pause after the dialog box is closed. I’m assuming this has to do with the queue being flushed, as you mentioned. Is there a different way to deal with these issues other than using pause? It looks like using drawnow has the same effect. To your question, I do not know of any simpler or better way to solve these hangups. It turns out that I could handle an event during pause, but not when I use Thread.sleep. % It's possible for the event handler to change KeepRunning to false when an event is fired. Yet, this is not possible when Thread.Sleep is used. % This loop will continue running, no chance is given to the event handler to do anything. Do you experience the same thing? I’m using Windows 32-bit MATLAB. In any case, I’d like to try and see where I can put Thread.sleep for my future MATLAB programs. @Ang – yes, I have also seen this. I am not exactly sure why this happens. It is probably EDT-related, but I am not sure exactly how or why. Try adding a “drawnow;” in that loop? Thanks for the `drawnow;` recommendation! It made this all work perfectly for me. Since the problem seems to be inside drawnow, using sleep+drawnow probably doesn’t help. @Marc – thanks for sharing. According to the patch description, it is not directly related to pause, but perhaps the issues are somehow related. Have you rerun this benchmark more recently? I wonder if there have been any improvements in this space. In recent Matlab releases, Matlab’s pause is no less (sometimes even more) accurate than Java’s Thread.sleep, with a consistent mean inaccuracy (overhead) of 0.1-0.2 ms and max inaccuracy of ~1ms, regardless of the pause duration. These values depend of course on the specific OS and CPU, so YMMV. Reza (15 days 6 hours ago): I have the same problem. this Java widget got error in compiling via Matlab 2018! Could you please show me how to solve this? GGa (17 days 0 hours ago): There isn’t anything “outside the UTF-8 range”. UTF-8 can represent any Unicode character, as far as I know.